An Audio Drama production based on the novel “The First Men In The Moon” by H. G. Wells. The novel tells the story of a journey to the moon undertaken by the two protagonists, the impoverished businessman Mr Bedford and the brilliant but eccentric scientist Dr. Cavor. On arrival, Bedford and Cavor find the moon inhabited by an extraterrestrial civilization the two refer to as “Selenites”. Script by Nat Segaloff and John de Lancie. Original Musical Score composed and performed by Peter Erskine. Music recorded at Puck Productions in Santa Monica, California. Editing and Sound Design by John Chominsky. 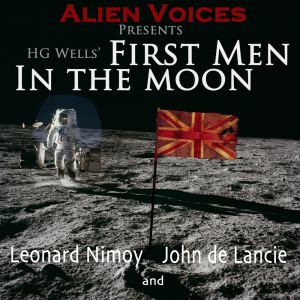 The First Men In The Moon was produced by Alien Voices, incorporated.